Spring came on with a rush this year, and it brought us to our knees. East State Street traffic island near Bob Evans shot up from their bed of pansies, then got a nice cool spell to prolong the show. On the Madison Avenue garden near Athens Flower Shop, blue catmint blossoms set off yellow tulips and miniature daffodils. At the Mansfield House, home of the tourism office on East state, red tulips and purple pansies bloomed along with daffodils. 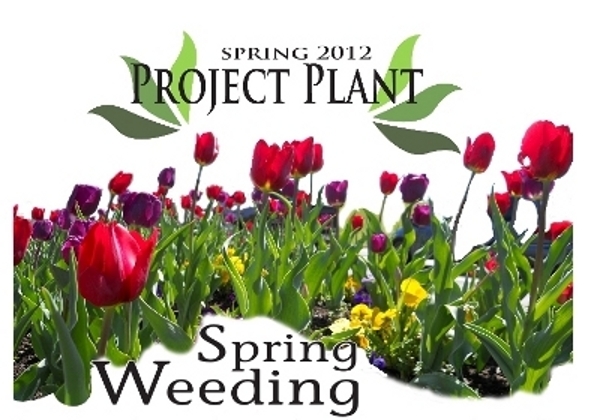 During the rest of the garden season you have probably spotted Project Plant volunteers in that distinctive weeding pose both at the Mansfield House gardens and at the Athens County Library gardens on Home Street. One library crew volunteer, Sharon Huge, has adopted the Second Street garden started by Project Plant and is recruiting neighbors to help. You may have seen the weeding saga at the end of April when 24 Ohio University students (pictured above) helped us as a part of their 2012 Beautification Day. The long strip ot landscape beds by the Community Center parking lot frontage along East State Street got a weed barrier of recycled cardboard that we soaked in a kiddie pool. 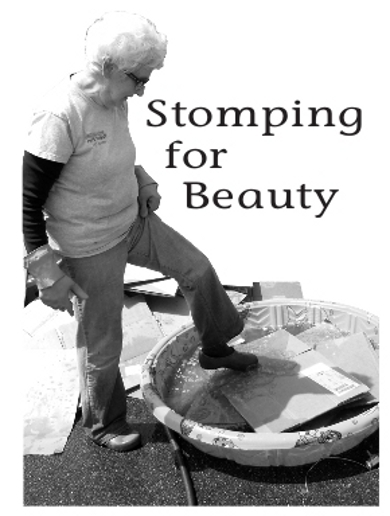 Sue Boyd is shown stomping cardboard below. A blanket of mulch, provided by Athens City Parks and Recreation, was put over the cardboard with the invaluable labor of the OU students. In a little over two hours they completed what would have taken us weeks. Project Plant volunteers had weeded the beds in the month before, plus put down pre- emergent weed suppressant to discourage weeds, then joined in the great mulching project April 29th.